The renovated space transforms the converted former St. John's building on campus. In recent years, the building has housed the ROTC program and Res Life offices. Once you met Cassandra Voss ’08, friends and family say, you never forgot her. The St. Norbert College senior, who died in a car accident in 2007 at age 21, was full of energy and passion. That legacy will continue when the new Cassandra Voss Center opens next fall on campus. 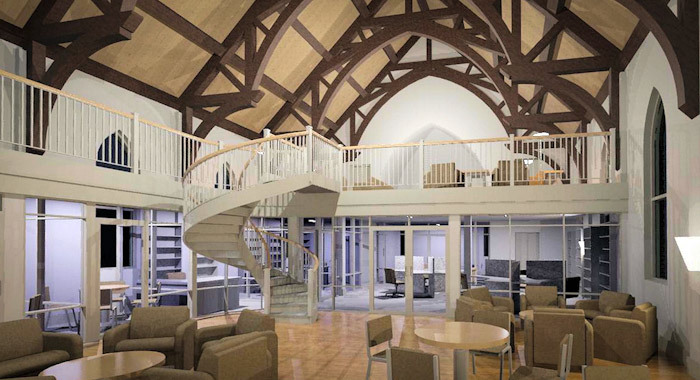 The Cassandra Voss Center will house the Joan P. Schaupp Women’s Center, the Men’s Initiative, the women’s and gender studies discipline, and other student amenities. Cassandra – who was on track to be the first St. Norbert student to complete an individualized major in women’s and gender studies – often talked about creating a single space on campus for all gender-related programming. The Cassandra Voss Center will be housed in the renovated former St. John’s Evangelical Lutheran Church, built in 1883. The $2.7 million that is funding the project ranks among the largest-ever gift totals for gender programming at a college or university. The renovation preserves the building’s historic nature while offering modern conveniences. “I saw this old building and found all of these gorgeous historic elements in the attic and thought it was the ideal place to help carry out her vision,” says Cassandra’s father, Kurt Voss. After his daughter’s death, he wanted to give back to the college that had given so much to his daughter. Karlyn Crowley (English, Women’s & Gender Studies) will serve for the next two years as the center’s interim director. Crowley taught Cassandra in several classes and served as her academic adviser. She says she’s “honored, humbled and thrilled” to lead the center. “This is a wonderful opportunity to have. Cassandra was such a special person and to be working in a facility that pays tribute to her honor is very special,” says Crowley. She will oversee the launch of the center and run it until a full-time director is hired. Crowley says the building includes classrooms, a performance space, a full kitchen, offices and a reflection space in the former church’s bell tower. “I feel blessed to be working in such a wonderful space,” she says. The center will offer campus-wide programming for students, faculty and staff members around a variety of topics focused on respect, dignity and mutual care. “We’re looking forward to doing cutting-edge, inclusive programs,” Crowley says. 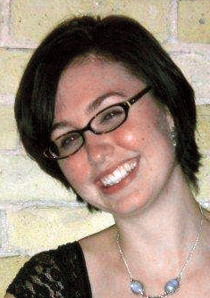 Cassandra Voss ’08 was born in 1985 and was a graduate of Hamilton High School in Milwaukee. While at St. Norbert College, Voss excelled in the classroom and in extracurricular activities, winning several awards for her creativity. Voss was on track to be the first St. Norbert student to complete an individualized major in women’s and gender studies. (She was also majoring in English, with a minor in art). She studied in London during the summer of 2006 and was planning to study in South Africa during the fall 2007 semester. Family and friends say Voss was a firm believer in the equality of all people and demonstrated that belief in her daily life. Voss died as the result of a car accident, in May 2007. Subscribe to our monthly emailed update of college news online.